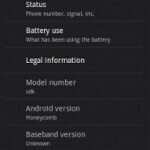 One of the guys at XDA-Developers decided to practice his rooting skills on the Google Nexus One, and the result is one very early Honeycomb build for the HTC handset. As can be expected, plenty of features are not working right now - among them making and receiving calls, text messages, Bluetooth, Wi-Fi, sound, camera and so forth - so this version's target group seems to be developers rather than end consumers. However, fixes are surely on the way, and it's refreshing in itself that a handset released in March 2010 can receive some Honeycomb love. The Nexus One actually released in January 2010.